Dr. Hoagland focuses on providing complete individualized primary care. He has a strong interest in orthopedic and sports medicine, including physical medicine, joint dysfunction, rheumatologic disorders, as well as advancements in pain therapeutics. His goal as your provider is to minimize pain and discomfort through patient education, motion and synergistic modalities such as nutrition, botanicals, hydrotherapy, and counseling. Dr. Hoagland has received training to diagnose and treat both acute and chronic conditions such as autoimmune dysfunction, diabetes (Type I and II), hypertension, thyroid dysfunction, seasonal allergies, adrenal insufficiency, connective tissue diseases, musculoskeletal injuries, and respiratory conditions. He is experienced in both men’s health and pediatric medicine. He graduated from the National University of Natural Medicine. He believes in the importance of preventive and collaborative medicine to meet the needs of every patient regardless of their age, race, gender identity, sexual orientation or socioeconomic status. Dr. Hoagland will work with you to maximize personal wellness, and help you achieve your desired health and activity goals. If you would like to schedule an appointment with Dr. Hoagland click here. Dr. Hoagland, an Oregon native, expressed a strong desire to pursue a career in medicine starting at a young age. He began working toward health certifications at the age of 16 that shaped his vision of optimal health and allowed him insight into health disparities within the community. 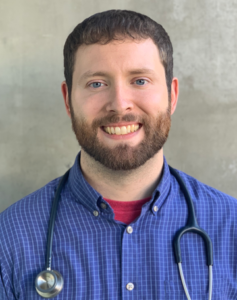 Dr. Hoagland later received his Bachelor of Science in Biology with a pre-med focused curriculum, and graduated with honors from Pacific University in Forest Grove. In his free time he enjoys getting together with friends, adventuring to the coast with his spouse and two sons, going on family walks, making salsa, fishing, archery, karaoke, and competitive bowling. (503) 445-8114 and we'd be happy to help you.